Hugh’s wife is dead. Hugh has told several different stories about last night, the night she died. He’s covered in blood, and he left his children alone in a hotel room while he returned to the scene alone. He let three hours pass between finding Olivia dead and calling the police. This isn’t something that can be easily fixed, and Sheriff Beckley knows that better than anyone. That’s why, though he tells Hugh he’s free to leave at any time, and though Hugh keeps saying he needs to go—go to his children, go get some rest—Sheriff Beckley keeps calmly, adroitly turning the conversation to reasons why he shouldn’t. That’s why, though he’s brought Hugh a cup of coffee to drink and clear his head, Sheriff Beckley walks out of the interrogation room still holding Hugh’s coffee. He even manages to make it sound like a favor. “I’ve been up all night,” Hugh reminds him. “I’ve probably said some pretty crazy things.” He has. He’s said Olivia was visiting her sister (and Shirley backs him up), though her sister doesn’t know anything about it. He insists that Liv didn’t kill herself, but swears he didn’t hurt her. He’s said—twice, Sheriff Beckley reminds him—that the house killed Olivia. Though he’s said more, much more, than he should have without a lawyer, he refuses to discuss the missing three hours between finding his wife dead and calling the police. “You’re not fixing this,” the sheriff laments. Henry Thomas plays this scene dazed but quietly determined. His eyes, carrying the same glazed cast they did when he returned from Hill House to the hotel soaked in blood, look more than shocked. They look empty. They look bereft. He’s in a mess. He wants to fix it. He wishes he could fix it. It’s a mess. She’s scattered. It just snuck up on me, is all. I can fix it. I’ll sort it out. Against the gentle, knowing advice of his dead wife, Hugh offers advice to his kids when he knows he stay silent and stays silent when he should talk. Olivia’s face face beams with love, with certainty, with something very close to serenity; like every shift in Olivia’s mood (and in the whims of things that look like Olivia), Carla Gugino makes this look effortless. Timothy Hutton again underplays Hugh’s torment, his hunger to do right and his certainty that he’ll do wrong, letting it show in his tired eyes. (This shared role of Hugh Crain is a great device, and one the actors execute with quiet confidence.) He knows it’s a mistake, it’s a mess, and he keeps doing it. He sticks his hand, as he and Olivia say in the shared shorthand of marriage, right in the fan. The scene where Hugh does stick his hand in the fan is a textbook example of telegraphing done right. For several episodes now, we’ve seen the grubby bandage on Hugh’s hand. We’ve just heard Liv and Hugh describe a moment of stupid action as sticking your hand right in the fan. We see the close-up of the plugs, we see Hugh distracted by a mold silhouette looming from the dripping wall. We know the oppressive presence of the derby man—who walled himself up alive in Hill House, then changed his mind—is at work here. It’s awful, it’s coming, and we have to sit and wait for the abrupt, horrible sound of Hugh’s hand colliding with the fan’s powerful blades. It’s inescapable, it’s unavoidable, it’s a mess. Liv’s master floorplan, designed to help them track down the possible leak, is a mess. Its interior is tiled with an odd shape repeated hundred, thousands of times. It takes Hugh a bit to see what she’s done, and even when he shows Olivia, she reflexively denies it. She’s taken the footprint of their Forever House, the one she’s daydreamed about and drafted for so long, scaled it down, and fitted it over and over into the layout of Hill House. Even Mr. Dudley (Robert Longstreet) knows Liv is a mess, and he knows why. To Hugh’s indignation, he suggests maybe “the missus” is “scattered,” and some time away might clear her head. In Longstreet’s hands, Mr. Dudley’s story of Hill House’s effect on his wife is riveting. It’s hard to imagine the upright, forbidding Mrs. Dudley weeping or wailing or tearing through the woods at night. It’s hard to imagine buttoned-up Clara as a mess. The buzz of the intense lights at first masks the rise of an ambient hum as Mr. Dudley tells Hugh about his mother, his wife, his stillborn daughter, until its patient, insistent rise makes it undeniable. It’s a great piece of sound design, and also a metaphor for the miasma of Hill House, creeping up on its inhabitants so gradually, they don’t register it until it’s overwhelming. 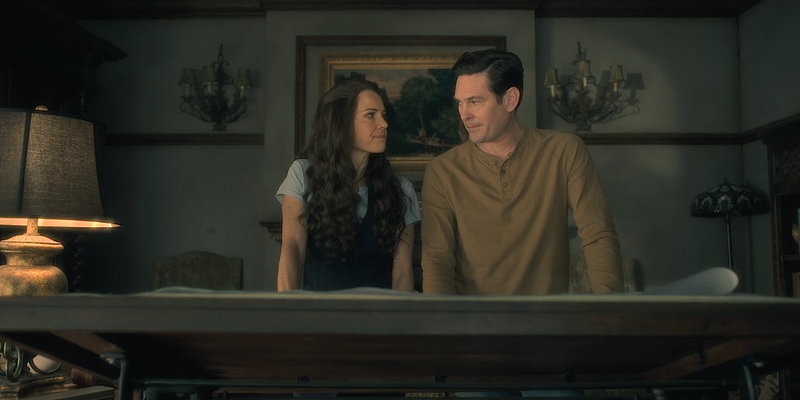 The Haunting of Hill House is working to fix itself. It’s pulling itself together. It’s sorting itself out. As the pieces come together, even the logy first few episodes have more purpose, more coherence. (I stand by my early assessments; a series is designed to watch in order, and the individual episodes need to be engrossing in their own right, not only in light of what comes later.) Even the overheated family drama, so often a dead weight in early episodes, works more like an anchor in “Eulogy.” Those jumbled, irregular pieces of story are starting to fit together, like the tiny footprint of The Forever House pieced together in Liv’s master plan: messy, but joining neatly. For all its fun jumps, beautiful camera work, and thoughtful acting, for the first few episodes, The Haunting Of Hill House was a bit of a mess. But it’s coming together. It’s fixing itself. I recently bought a rambling old house, and though I haven’t faced a disaster like Hugh and Liv’s (yet), like most homeowners, I recognize the fear that lies behind Hugh’s anger. He takes that anger out on Hill House, not just in the necessary onslaught of activity that black mold demands, but when he attacks the locked door of The Red Room with hammer, screwdriver, and pry bar. And after he does, he wakes up with a screwdriver (that same screwdriver?) poised on his jugular. 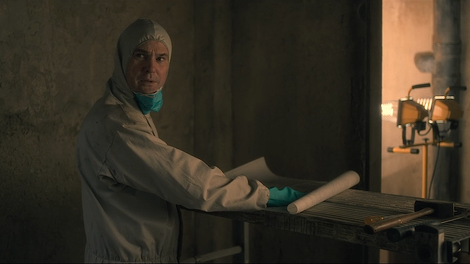 The clean suits, masks, and and industrial lights Hugh and Steven use are entirely justified by the moldy cellar, but to me they also look like a nod to the government agents with their hazmat suits and glaring lamps toward the end of E.T. The Red Room is open, but not because Hugh opened it. Because it’s ready. "I am disappearing inch by inch into this house"